In a big win for British comedy nerds, The Times is reporting that multiple boxes from Michael Palin’s private archives have been delivered to the British Library, and—unsurprisingly—they contain a whole bunch of Monty Python paraphernalia. 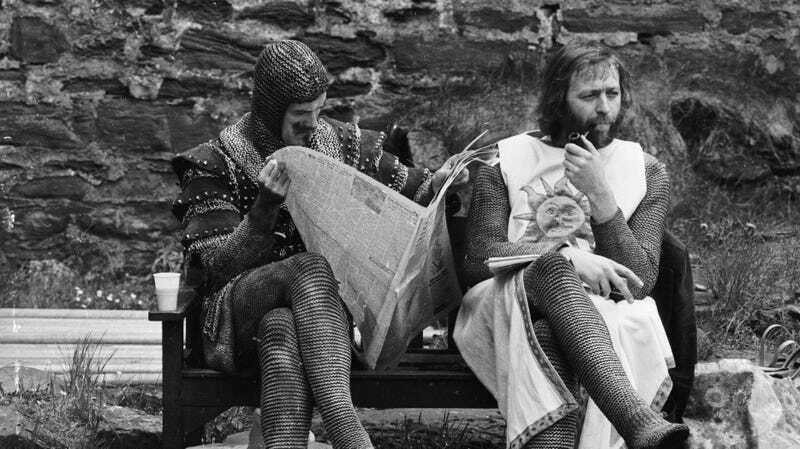 There are apparently “dozens” of unused scripts for sketches, including two sequences written for Monty Python And The Holy Grail that center on a Wild West bookstore and a pink knight that won’t let King Arthur cross his bridge until Arthur gives him a kiss. The Times has reprinted the scripts for these sketches in full, and the for bookstore one is rather clever send-up of cowboy tropes about a rampaging gang that demands more books about horses. The one about the pink knight, on the other hand, is pretty homophobic. There’s often a reason why unproduced things don’t get produced, after all. The boxes also include “more than 50 notebooks filled with first drafts and ideas” for Monty Python stuff, along with scribbled notes from planning meetings for Holy Grail and Life Of Brian are apparently “radically” different from the finished films. The Times says some of the cut material “would have caused controversy at the time and is risqué even now.” The notes also mention that Holy Grail was initially supposed to have a more traditional ending until the Monty Python gang decided it would be funnier and cheaper to do the ending they used in the final draft. The British Library is still going through Palin’s collections, but a “small selection” will be accessible by the public on August 7.